Did anyone else notice the carefully placed production logo on this past Monday’s episode of Prison Break? Let me set it up for you. Michael Scofield (played by Wentworth Miller) dons a guard’s uniform so that he can snoop around the psych ward without anyone asking too many questions. He goes down to the basement so he can access the underground pipeline that he needs to escape. As he walks through a particular room, a POV-esque shot reveals a hallway of detritus through which he must navigate to get to the pipeline access point. 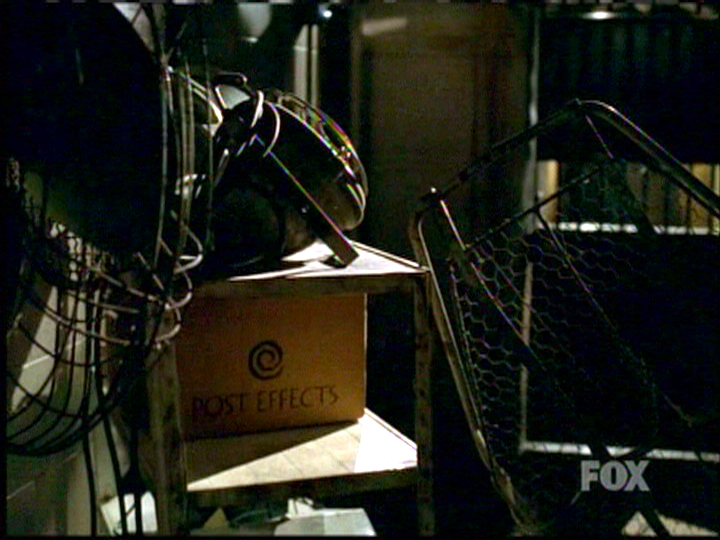 Sitting on a shelf in said hallway is a box with a swirly logo and the words “Post Effects” written on it. Here’s a screengrab of the shot where you can see the box (in the interest of full-disclosure, I took the image into Photoshop where I de-interlaced it and adjusted the levels to make the box more visible). Now, I don’t know if Post Effects actually works on Prison Break or not, but they are a production company (and that is their logo). It was fun, if somewhat unprofessional. Seeing the logo totally took me out of the moment, which is definitely not what set decoration is supposed to do. To be fair, when I was shooting back in high school and college, I would routinely decorate my sets with little jokes (especially in college). But, and I cannot stress this enough, they were little, inside jokes; things that were funny to me, the crew, or the rest of the class. Anyone who wasn’t connected to the production wouldn’t have even realised what they were looking at, and even then, I’m sure a lot of the crew never realised either. I suspect that whoever put that box in the shot was trying to do something similar. They failed. Comments: 5 Posted by: Thomas J. Brown Categories: Blog 0 People like this. Be the first! To be fair, I was also watching Prison Break and didn’t notice the box at all. I never doubted it was there (Thomas has an amazing ability to notice things in the background like that, even if they only last for a few frames). But, it didn’t interrupt my viewing pleasure at all. I guess I was distracted staring at =hot= Wentworth Miller. Perhaps, and I might be crazy, the PA who helped dress the set forgot to turn the box the other way there by hiding the logo and it was a freak mistake that no noticed until it was too late? But I know that most of the time it’s not a mistake, but perhaps there is a slight chance that this time it was. Kris pointed out the same thing, and before posting I had considered that, but even if that’s the case, it’s still an unprofessional mistake. 6 years later, watching this show on Netflix, this box really stood out to me so I googled it wondering if it had any significance. While I’m disappointed it wasn’t some big clever ARG clue or something, I do agree with the sentiment that this box did not belong. @Daniel – Pro Tip: Stop watching after Season 3.